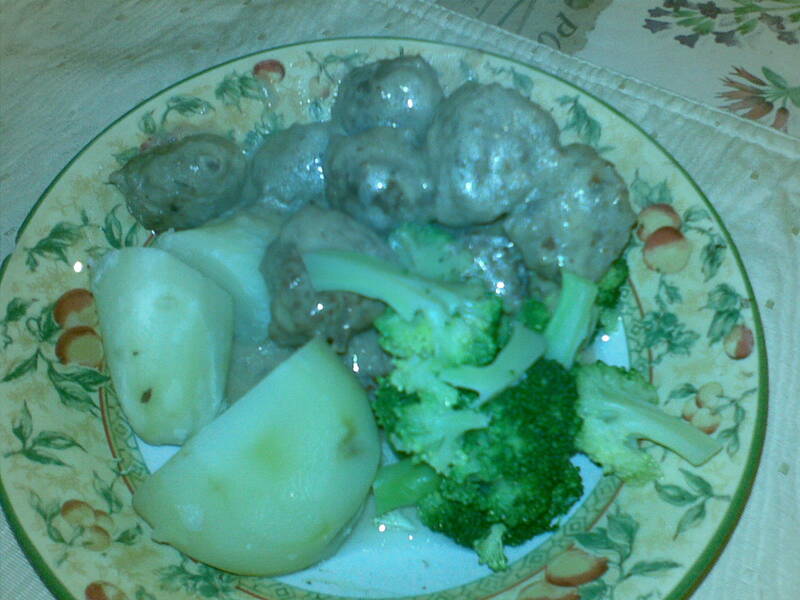 Place all the ingredients for the meatballs except butter in a large bowl. Mix all the ingredients thoroughly. Using wet hands, shape the mixture into tiny balls the size of golf ball. Heat the butter in a frying pan. Fry the meatballs one layer at a time, turning occassionally until brown all over. When finished, add the flour to the butter, stirring and scrapping the juices from the meat. Then pour the beef stock stir and let boil. When the gravy thicken, add the sourcream. Check seasoning, add the meatballs, turning to make sure they are evenly coated. Serve with steamed vegetables and boiled potatoes and if you can get it, cranberry jam. To me, bolognese sauce is very versatile. Most times, I make double portions and freeze the rest. I would then convert the other portion into a chilli con carne to have with rice the next day or into a pie with mash topping to bring new interest to it. Or if you are a pizza lover you can spread it over a pizza base, sprinkle over some sliced mushrooms and top with grated cheese – makes great pizza! In a deep saucepan, heat the olive oil, add the onion, garlic and ginger stir until soft. Add the vegetables, mince and stir. Add the chopped tomatoes; tomato puree, herbs and chilli. Stir again. Season with salt and pepper. Gently bring to boil and then cover and let it simmer slowly under very low heat for 30-40 minutes. Stir occasionally to stop it catching. Meanwhile, boil the spaghetti following the instructions on its packaging until al-dente. Serve with the sauce ladled over it. This is normally served with grated parmesan cheese but I have had difficulty looking for a halal version of it therefore I go without. It just so happened that I had a parsnip and a butternut squash which my dear mother-in-law has pulled out of her back garden and I have been wondering for days about how to use them. 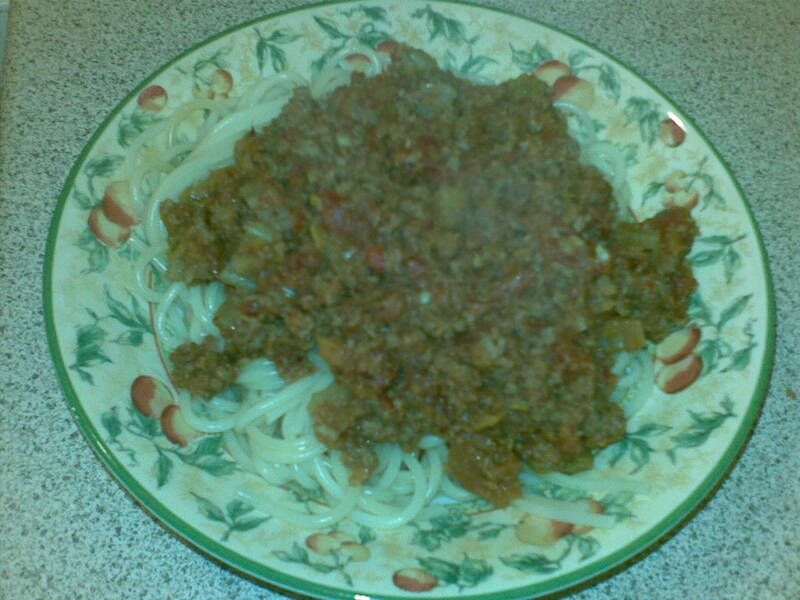 I also had some leftover bolognese sauce but I was reluctant to have it with spaghetti again. Having had a browse through of Jamie Oliver’s new book “Jamie’s Ministry of Food” in Waterstone bookshop today, I got this idea of turning the bolognese sauce into a pie and using the two vegetables and some potatoes as topping. It was an experiment (and my experiments don’t always turn out right) but this time dear hubby says it was yumm… It was a pleasant surprise that the mixed mash actually turned out very good and I was glad because (in this climate of rising food cost) I was able to make a pound of lamb mince stretch a little bit further. Heat the oven gas mark 8. Put the parsnip, butternut and potatoes in a saucepan, cover in cold water and bring to the boil until soft. In the meantime, heat the vegetable oil in another saucepan, add the carrot and stir until soft. Add the mushroom, cumin and curry powder and the bolognese sauce. Bring to boil stirring occasionally. Check seasoning. Simmer until sauce thickens. Meanwhile strain the potatoes, parsnip and squash, add butter and mash until smooth. Season with salt and pepper. 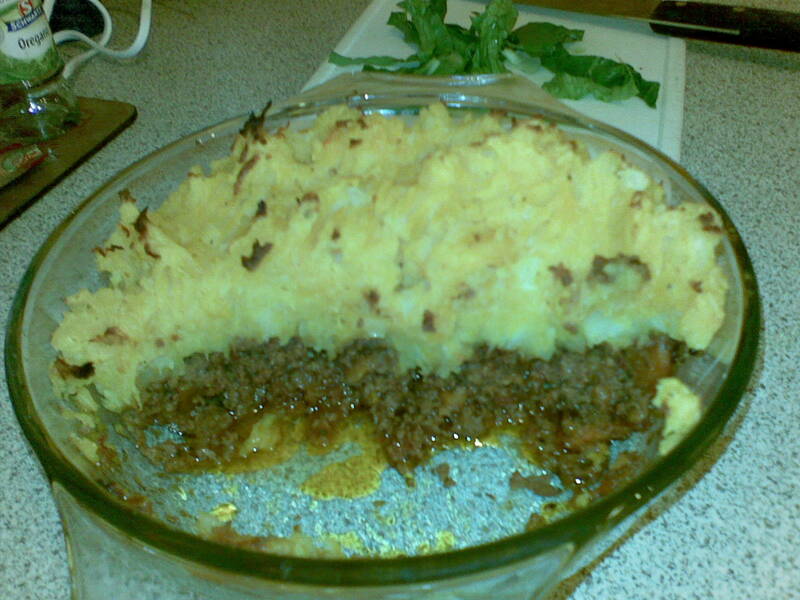 Pour the thickened sauce into a casserole dish, top with mash and bake for 20 minutes. Serve simply with green salad.